This is the perfect light for small spaces like small grow tents. 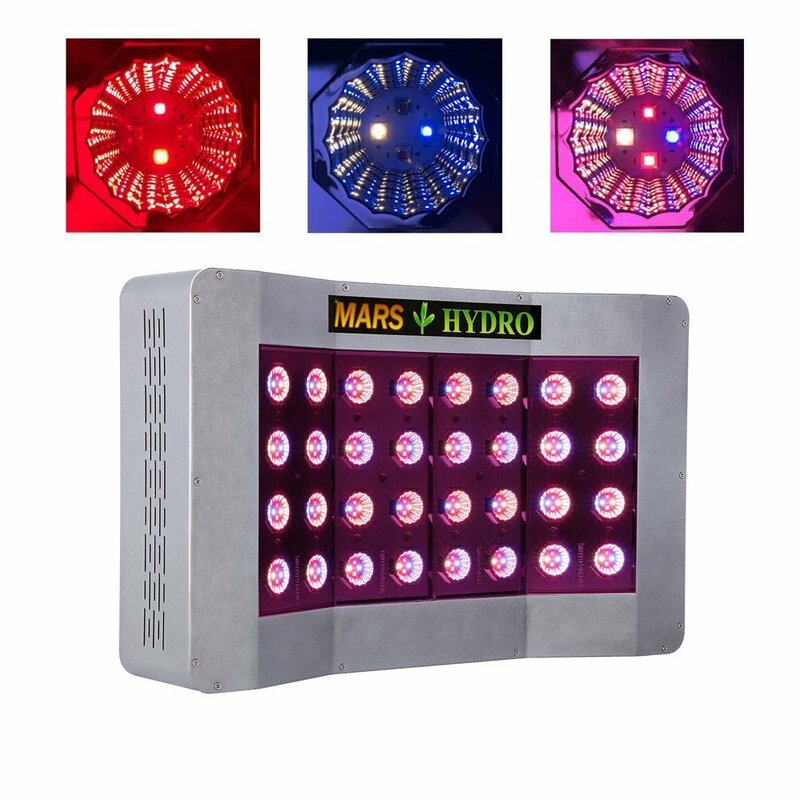 The Marshydro pro LED grow light is a premium lighting system for every type of plant. Better heatsink technology to give a cool environment which is essential for better plant growth. It has the lifespan of between 50,000 to 100,000 hours. So this gives overall very low running cost (in fact no need to buy the cooling unit- inbuilt fans are enough to keep it (light) cool). LED lights always have a longer life than other lighting technology. As it has more power than mars 300 so it is slightly bigger in size. There is not much difference in size but there is do have a difference in weight of light (300 watts and this 640 watts). Product dimensions are 20 inches by 13 inches by 5 inches in simple language it is 2 inches long (length) and 13 inches wide(breadth) and 5 inches in height. It covers the nice area of length. If you hang it to 60 cm it will effectively cover the 2feet by 3 feet area. For the vegetative stage if you put it to the height of 70 cm that is 30 inches it will cover the more growing area. Light uses 128 pieces of Cree LEDs, these are high-intensity light diodes and use of this technology put it on number first then other similar lights. This technology is new in the market but is very well tried and tested. Cree chips are highly efficient the reason behind Cree chips is to make s such chip and light which reduces the running cost to a great level. As we mention it uses the 128 LEDs this is a very large number of LEDs in single light (Cree LEDs). the light is capable to replace 400 HPS bulb. The full spectrum light emitted by this amazing product is what plants need to grow. It also gives an easy option to connect multiple lights or as much as you want with its U shape connectors. Again you will two switches for bloom and veg stage. You can find two high-speed fans on the top whirling, the heat sink technology is much better as compared to its competitors. Whole light has ETL certified UL certified wires and VDE plug for better safety. The environment should be controlled for better growth in all stages. From the controlled environment, we mean better control on light intensity, proper heat sink technology. We recommend this light for small to medium grow tents. The light spectrum is of high intensity which means more red and blue light for plant growth. All lights are tested for 48 hours before shipping to ensure that everything is fine. At this price range, it is good to buy this product due to many benefits. We observe sudden positive changes in our plants within the time frame of 20 days.